The C# language uses exceptions to handle errors and other exceptional events. Exceptions are the occurrence of some conditions that changes the normal flow of execution . Exceptions are occurred in situations like your program run out of the memory , file does not exist in the given path , network connections are dropped etc. More specifically for better understanding , we can say it as Runtime Errors occurs during the execution of a program that disrupts the normal flow of instructions. In .NET languages , Structured Exceptions handling is a fundamental part of Common Language Runtime . All exceptions in the Common Language Runtime are derived from a single base class , also you can create your own custom exception classes. You can create an exception class that inherits from Exception class . 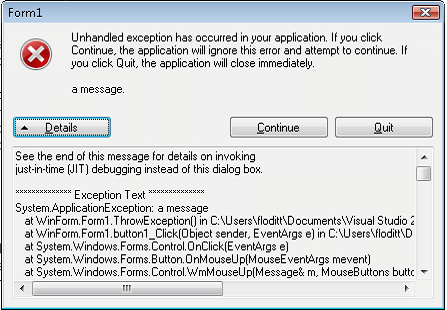 Creating an exception object and handing it to the runtime system is called throwing an exception. The code in the finally block will execute even if there is no Exceptions. That means if you write a finally block , the code should execute after the execution of try block or catch block. The following example trying to divide a number by zero. From the following C# code , you can understand how to use try..catch statements. Here we are going to divide a number by zero . When you execute this C# code the above source code , the program will throw a DividedByZero Exception and after that the control wil go to finally clause.